There was a question asked a while back about case trimming and deburring. I was playing with my camera last weekend and took the pictures below. All of the cases were new and have been run through the sizing die. The left case is just as it came from the factory. The center case has been trimmed to length but not deburred. The right case has had the full treatment, trimmed and deburred. You can see that the untrimmed case still has a bit of a sharp edge on the inside of the mouth. I've had new brass, untrimmed and not deburred, shave enough jacket, or lead, off of a bullet that I had to pull the bullet and start over. I think the shaved material could have interfered with chambering the round. The trimmed but not deburred brass obviously has sharp edges that would do the same. 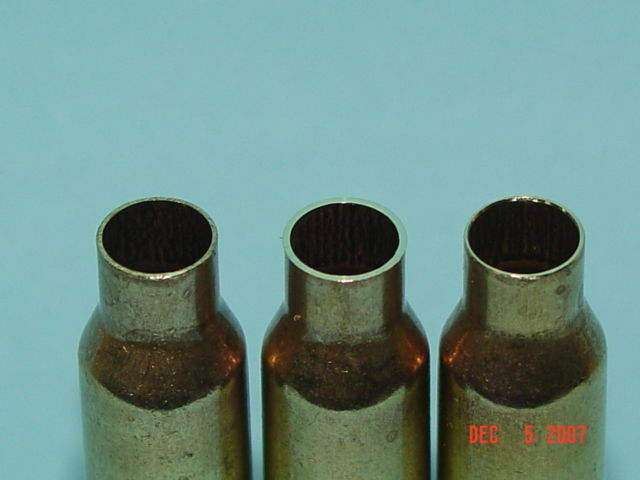 The deburred brass allows easier bullet seating as well as a more consistent crimp by removing the burrs. Depending on the cartridge you might have to do this once every three to eight times you reload the brass. To me its worth the effort to promote consistency. 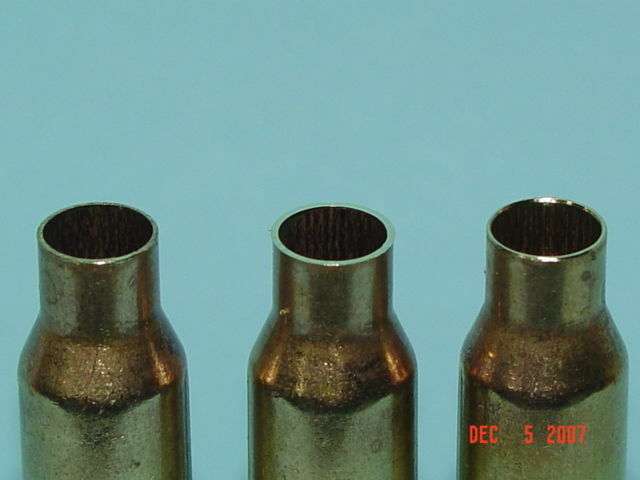 I cut the case length and debur each time I reload the brass. I also polish the brass, including the deburred end, with 000 steel wool. Try spinning the case and polishing it with the steel wool and then take another picture. You will find it to be even smoother than just deburring alone. I use a case holder from Lee Precision and a small drill clamped into a vice to hold and spin the case. I then grab the case with the 000 steel wool. It doesn't take long and the results are worth the small effort. I use various Lee Trimmers and and RCBS chamfer and deburring tool as required on all cases whether they are new or used. The extra time that a guy spends doing a good job at the reloading bench really shows with better results at the range and in the field. I tumble all of my brass before reloading, and last summer I purchased a RCBS Trim Mate Case Prep Center. It's faster and does a better job than I do by hand. I still use my Forster Case Trimmers that I have had for over 30yrs. Tell em Eric..... The RCBS prep center combined with the case trimmer mit motor is the best Christmas gift a reloader can get. The three way cutters are just like the dawn of the modern age for a reloader stuck in the dark ages of hand cranking. I even go one step further, I took a 3/4 inch copper cap for plumbing and filled it full of steel wool. 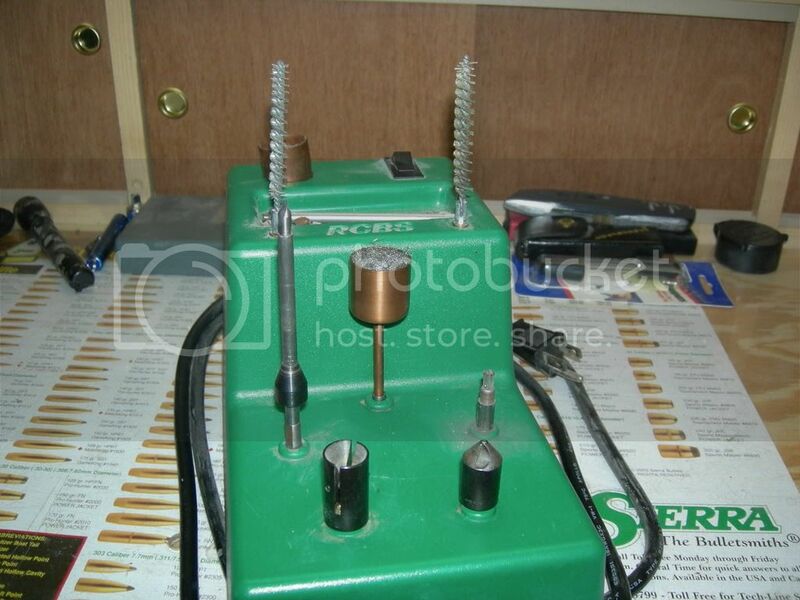 Then I soddered it to copper round stock and threaded it to fit on my RCBS case trimmer. After I trim and debur; I put the case on the steel wool to completely remove burs and polish it. It only takes a couple seconds and I have pulled bullets in the past with no scratches on them at all. I'm going to do the same in the morning. doublejs, the RCBS case prep centre you posted a pic of, does it power spin all of the tool stations, or exclusively the two upper ones? It spins only the bottom five (5), the top two brushes are stationary. I just put the brushes there to clean out the necks of the brass. Your idea on the top left station is much better than the plastic container of goop that RCBS has, Double. I use the primer reamer all of the time on the unit also. If a primer goes in tight on my Lee Classic Turret Press, I just ream it out and have no problems after that. I guess I should have mentioned that the cases in my pic still have the sizing lube on them, which caused some brass shavings, etc. to stick to them. This is after trimming with the Lee Case Length Gage and ball cutter and chamfering in and out. Has anyone measured to see if they are removing much brass using steel wool on cases? I monitor my 280AI neck thickness religiously and have never found it to be reduced. After neck turning for the original thickness needed it stays the same, at least through the 7th loading which some of my brass is on now.